With so much to do, we'll write your bride speech for you. Are you a Groom looking to buy a wedding speech? Don’t stress! Buy your Father of the Bride speech today. Would you like to buy a customised Best Man speech? Speech writing is not easy and writing a wedding speech is even more challenging. So we’re here to relieve your pain and ease your worries by writing a memorable speech for you. 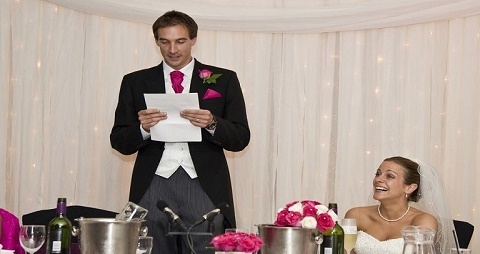 With your personalised input, we'll write your wedding speech quickly and professionally. You could spend hours trawling through the internet trying to cut and paste your speech, inserting jokes here or there. However, a copied speech won’t have your voice and it will be easy to tell that the words aren’t your own. 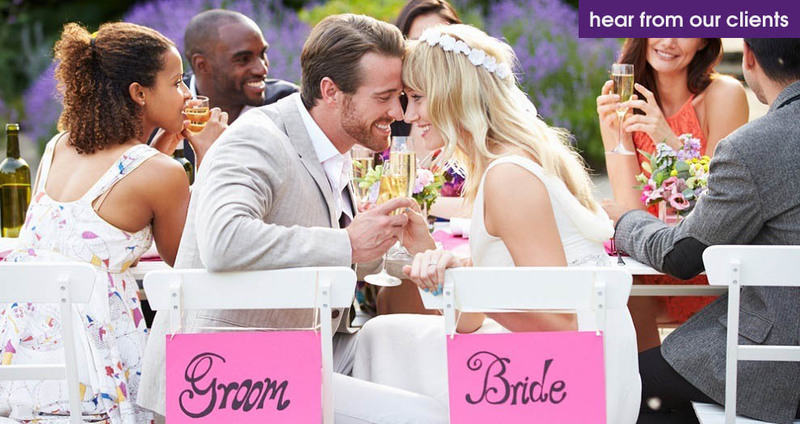 Don’t you think the bride or groom who chose you, deserve an authentic and heartfelt speech? A wedding speech should be an intimate expression of your feelings. 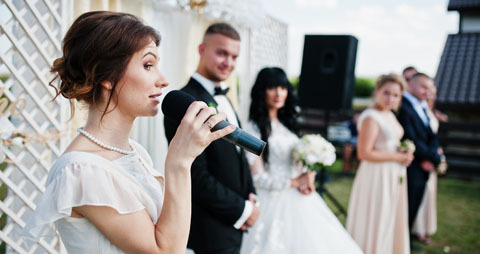 Your wedding speech should be unique and personal. We’ll help you craft a wedding speech that is tailored by and written for you. And don't forget, our wedding speech writing service is completely confidential - no-one will ever know you didn't write it yourself! “I would like to tell you that the Father of the Bride speech you wrote for me connected so well with the guests that at the end I had a rapturous applause. But the best moment for me was when my daughter said to me - Dad that was a great speech. Carole, thanks for writing me such a beautiful speech.” Mark R.
We're a small group of professional wedding speech writers who compose exceptional speeches for you. Your speech will be customised to reflect your thoughts and feelings for a very special day. We are wedding speech experts! Let us remove the stress of writing your wedding speech. And don't forget - our speech writing service is completely confidential and no-one will ever know that you didn't write it yourself! We can edit your existing speech or write a new one from scratch. We’ve written speeches for clients from South Africa to Australia, and we’re excited to help you. 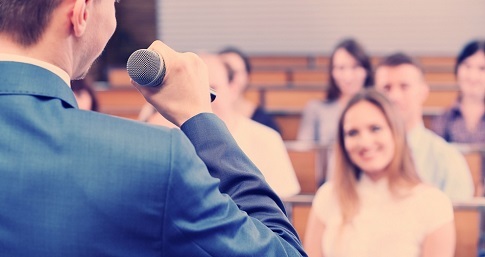 We also offer coaching services to help you deliver the perfect speech. Our principal writer, Carole Spiers is an author and motivational speaker, she will give you the hints and tips needed to help you deliver your speech with poise and panache. Coaching consultations are conducted in-person or via Skype -depending on what works out best for you. Given that you’re speaking of people you know and love, you already have an idea of what you want to include in your wedding speech. Funny stories and tasteful jokes are the parts of the speech that only you can provide; we help you incorporate them into a memorable speech. 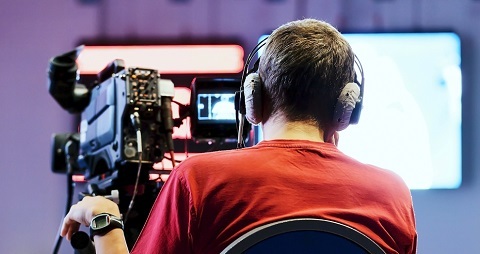 If you’re having sleepless nights and don’t know where to start, or finish, we take away all the hassle by providing you with a uniquely personal speech. Years ago, it was traditional for only the Groom, Best Man and Father of the Bride to make a wedding speech. The idea of three speeches being given by three men has become a thing of the past. Maids of Honour, Bridesmaids, and Mothers of the Bride or Groom now deliver wedding speeches. A Wedding speech should involve and excite the audience, not put them to sleep! Speeches can be put to music; they can include stories from the past and be brought to life with pictures. The choices are endless and there is a great opportunity to be creative and deliver one of the best wedding speeches a guest has ever heard. It’s very easy to get emotional at a wedding, but your wedding speech isn’t the time for tears. Remember, you aren’t speaking to just the bride and groom, you’re there for the guests as well. 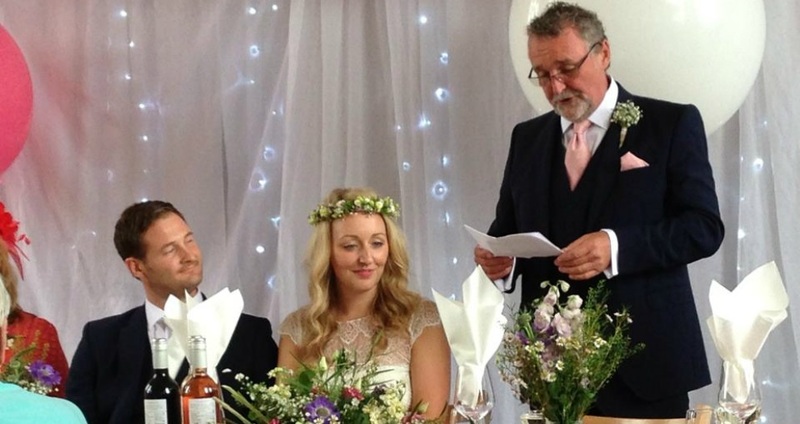 All wedding speeches are composed by wedding speech writer, Carole Spiers and her team. Confidential – no one need ever know you haven't written it yourself. Quick turnaround. We've never missed a wedding yet! 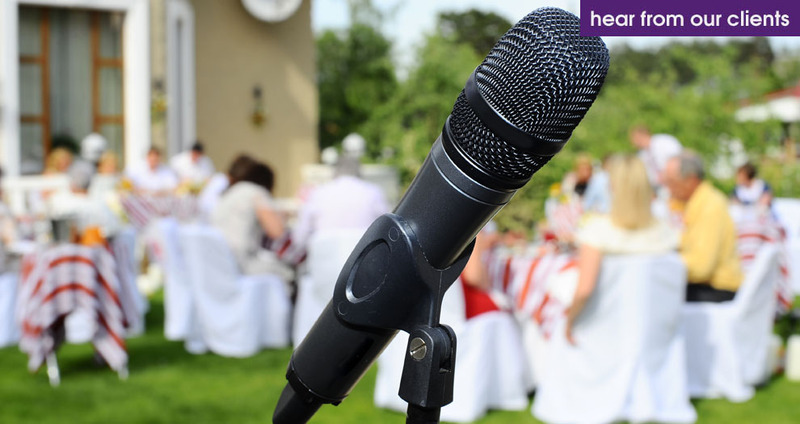 Don’t waste time, check below to find out how you can have a wedding speech to be proud of. Your wedding speech will be then written and sent back to you for approval within 3 days. Our wedding speech writing is a confidential customised service, so don't waste any time to contact us now! Hear From Our Satisfied Clients? Just listen to some of our satisfied grooms, best men, brides, maids of honour, and fathers of the bride and they'll tell you why! We had a wonderful wedding last month and my father of the bride speech went down brilliantly and I received loads of compliments. I can't thank you enough for your help. I have to say I was unsure of coming to you at first, but I am so delighted that I took the plunge and did so. Absolutely perfect. We got married last month and my wedding speech is still the ‘talk of the town’. My bride was proud of me, my parents couldn’t believe their ears, and I think my in-laws were rather impressed! Thank goodness I found you. The wedding speech you wrote for me was exactly what I wanted to say. I can’t thank you enough. You took all my stress away! Copyright © theweddingspeechexpert.co.uk all rights reserved.